Plastex began its long-standing relationships with these retailers by fabricating plastic sneeze guards to protect food offerings, according to Dan George, purchasing manager and designer, Plastex Fabricators, who said the company soon after was asked to fabricate store décor – including wall work, millwork and cabinets – originally utilizing melamine and plywood materials. While melamine and plywood are sturdy substrates, they also are heavy materials that pose a potential danger to store customers, employees and installers when interior décor pieces fabricated from these materials are suspended overhead. That’s why Plastex began fabricating interior décor and signage for these retailers from Gatorfoam® graphic display board at least 15 years ago, said George. 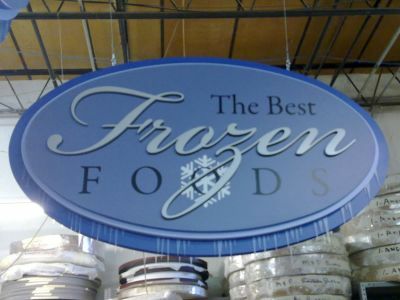 Plastex Fabricators’ supermarket chain and convenience store customers regularly update décor and signage. Plastex employees will devote approximately two months to updating an entire store’s décor, according to George, who said these retailers rely upon Plastex to recommend materials. 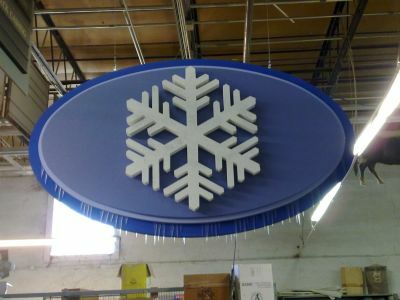 Plastex Fabricators utilizes Gatorfoam to create multi-layered two-sided departmental signage and store décor as well as cut-out lettering. Cutting is achieved with CNC routers, while pieces are custom spray-painted with Sherwin Williams paints. Pieces that require digital printing or screen printing are sourced out, while laminated décor is completed in-house. Multiple layers of Gatorfoam used to create small store décor pieces are attached with foam tape or silicone, while large signs are screwed together, according to George. Plastex creates the majority of its displays with Gatorfoam – which is distributed by the Charlotte, N.C., branch of Polymershapes, the distribution unit of SABIC – in the Bright White and Black colors in thicknesses ranging from 3/16-inch to 2 inches and in standard sheet sizes up to 60-inches by 120-inches. “Polymershapes does a very good job of keeping us stocked with Gatorfoam,” said George.